Are you new to meal planning? The tools and resources listed below are my personal favorites that have helped me stay organized, lose weight, and save time + money. Healthy Meal Planning Bundle – If you’re tired of repeating the same meals and need some new healthy meal ideas, this bundle comes with 1072 whole food recipes, 28 meal plans, and more! Easy Weekly Dinner Plans – If your main goal is to save money, The Dinner Daily provides weekly dinner plans and shopping lists designed to help you lower your grocery bill. Freezer Meal Plans – If daily meal planning stresses you out, Once a Month Meals will help you get started with freezer cooking and simplify the process! Supercook – A free website where you can enter in any ingredients you already have on hand and it will give you ideas of what you can make with them. Really helpful for using up your existing inventory. Free Workshop by Erin Chase – This free workshop will teach you how you to cut your grocery spending and determine your grocery budget. 2019 Budgeting Worksheets – 21 Finance printables to help you get your finances in order so that you can save more, pay off debt, etc. 12 Tips for Grocery Shopping on a Budget – In this post, I share 12 simple tips for cutting your grocery bill– Without using coupons. 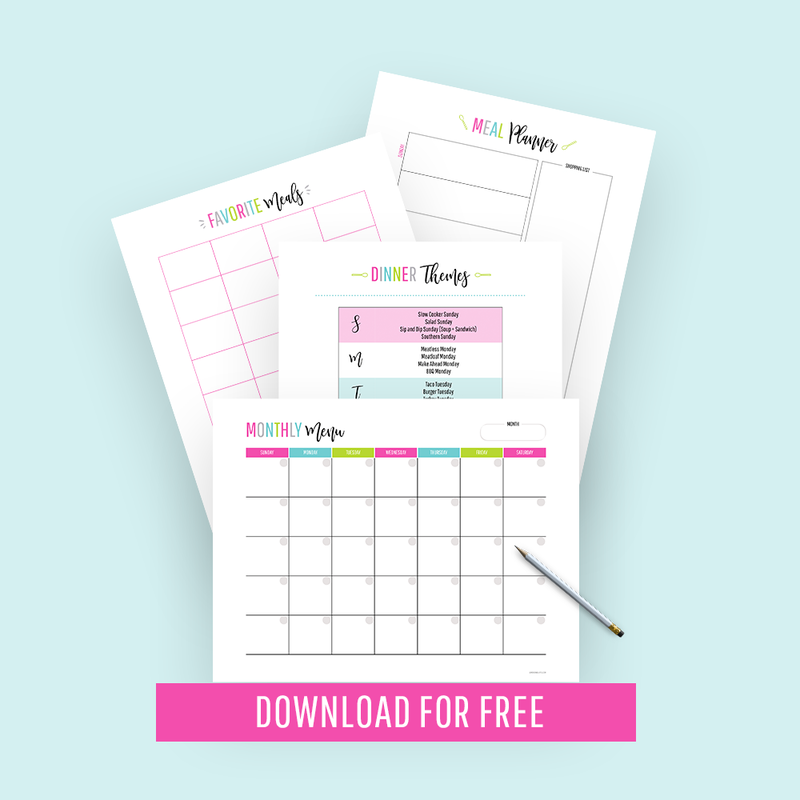 Free Meal Planning Printables – Stay organized with free weekly meal planners, favorite meals tracker, monthly menu planner, and more. NuWave Pro Plus Oven – I love this thing! It uses 70% less energy and cooks food in 70% less time than traditional cooking methods. Ninja Fit – I went through several blenders over the past few years before I found the Ninja Fit. I only wish I had found it sooner. Best of all, it doesn’t hog your counter space. Meal Prep Containers – Prepping some of your meals is a huge time-saver. You’re way more likely to stick to your goals if you have food on hand you can grab quickly. I always go for BPA-free containers. Keep in mind it’s much cheaper to buy them in bulk. (I got 20 of them at once when I purchased mine.) My favorite are the two-compartment containers, but you can also get them with three compartments. Small Mason Jars – These are great for prepping overnight oats, sauces, etc. I love mine! Digital Food Scale – If you’re trying to lose weight, I highly recommend a digital food scale. I’ve had mine for years and it really comes in handy when you’re trying to keep your portions in check. Blue Diamond Ceramic Pan – This is my current favorite pan and I use it for everything! I love that it’s nonstick and toxin-free! Rice Cooker – A rice cooker isn’t mandatory, but it definitely makes things easier because you can set it and forget it. Really makes meal prep a breeze since you can cook a lot at once. Crockpot/Slow Cooker – I love that I can wake up and throw dinner in my crockpot and know that I’ll have a tasty meal ready later without having to do any more work. Not only that, it makes everything so tender! I just have a simple one like this, but it might be worth it to spend a few extra bucks and get one with a timer if you don’t want to keep track of it yourself. Lemon Squeezer – My sister got me one of these a couple years ago, and I love it so much. I recommend getting a heavy duty one like this. Don’t waste your time fiddling with those plastic ones.